Mary Ann Lampe in front of her beautiful quilt in the McWane Ductile-Ohio lobby. 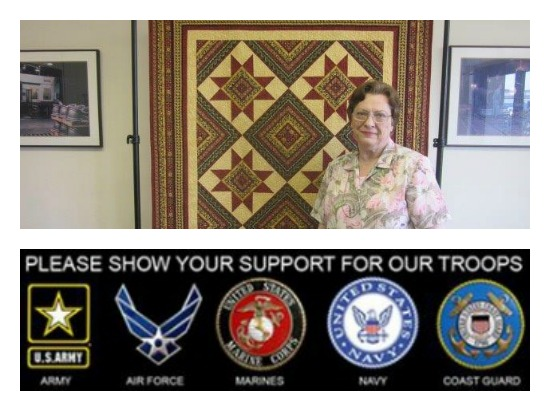 Mary Ann has made lots of quilts over the years, but this one is special because she made it to help raise money for the Clow Veterans Group (CVG). The CVG was started 5 years ago to provide assistance and support to not only Clow veterans, but also veterans and active military that live within the community. They are very excited about recently becoming the first group in Coshocton County to be Friends of the Family Readiness Group for the 1485th Army National Guard located at the airport in Coshocton. Another part of the unit is also located in Dover, Ohio. The CVG meets on the 3rd Saturday of each month at Hardee’s in Coshocton. They have many projects that they plan to support in the months and years ahead. A big thank you to the CVG for paying it forward in the community to help veterans that have sacrificed so much!